CHICAGO – One of the exciting weekend film festivals in Chicago is DOC 10, a celebration of non-fiction filmmaking at its highest level. And no one knows that more than Steve Cohen, the co-founder – with Paula Froehle – of the festival. Cohen and Froehle not only help facilitate and curate DOC 10, but also produce documentaries through their Chicago Media Project. The Closing Night Film of DOC 10, on April 14th, 2019, is “Biggest Little Farm.” For more information and tickets, click here. “Biggest Little Farm,” is a testament to the immense complexity of nature. Two dreamers, John and Molly Chester, leave the city to build a diverse and sustainable farm. The building of their utopia involved eight years of ups and downs, with a lesson of good intentions in harsh practical challenges. Watch for the release of the nine other documentaries in 2019 (and in awards consideration) ... “Mike Wallace is Here,” “Midnight Family,” “Anthropocene: The Human Epoch,” “One Child Nation,” “American Factory,” “Hail Satan?” and “Knock Down the House.” Also on Sunday, April 14th, will be “The Distant Barking of Dogs” (2pm) and “The Infiltrators” (4:30pm). For more info on Sunday events and tickets, click here. 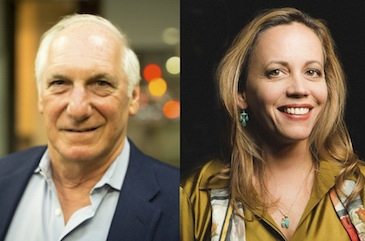 The co-founders of both DOC 10 and the Chicago Media Project (CMP) are Paula Froehle and Steve Cohen, and they are also notable producers of docs through the project. Films influenced by CMP – a member based philanthropic community who believe in the power of media to bring about social change – include this year’s DOC 10 screenings, “Knock Down the House” and “One Child Nation,” as well as last year’s doc hit about Fred “Mr.” Rogers, “Won’t You Be My Neighbor?” They are Executive Producers on “The Infiltrators,” also featured at DOC 10. In Part One of a Podtalk with Patrick McDonald of HollywoodChicago.com, Steve Cohen of DOC 10 and the Chicago Media Project talks about the festival and the state of documentary art in 2019. In Part Two, Cohen observes the nuts-and-bolts of modern documentary filmmaking, the goals of CMP and the state of the film atmosphere in Chicago. The Chicago Media Project presents DOC 10 from Thursday, April 11th through Sunday, April 14th, 2019, at the Davis Theater, 4614 North Lincoln Avenue, Chicago. For general information about the festival, click here. For information regarding the Chicago Media Project, click here.